The Associated Vending Services (AVS) Group celebrated a milestone 40th birthday by hosting a fun-filled evening of entertainment and good food at the Custard Factory in Birmingham. 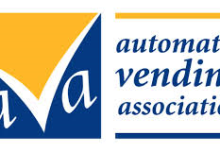 The AVS was established in 1979 when a small group of independent, privately owned vending companies created a members’ consortia to exchange information and ideas to benefit all. This arrangement has now endured for 40 years. 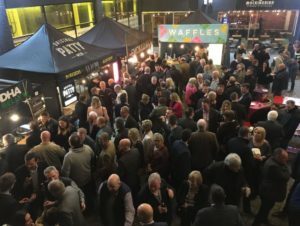 On March 21, after an AVS members’ meeting at the International Convention Centre in Birmingham, 360 guests including founder members, old staff, buying groups, and suppliers old and new, gathered for a mingle in an urban circus themed event with street food supplied by the Digbeth Dining Club. Digbeth Dining is described as a premier Street Food venue. Featured regularly on TV (most recently on James Martin’s ITV show) these traders are highly skilled chefs who have chosen to go it alone and fight the rising tide of chain restaurants. They are self-funded entrepreneurs who’ve risked it all to provide scratch-made food that they are passionate about while using sustainably sourced ingredients, as well as recyclable glass, packaging, cutlery and chopsticks. Among the street food traders were Thai food specialists, Budda Belly, The Orignal Patty Men, Crushed and Cubed, Baked in Brick, The Brownie Bus and Urban Cheesecake. While enjoying a cocktail and a sampling a variety of treats from the Digbeth Dining Club, guests were able to enjoy party atmosphere with upbeat music as well as a series of mind-boggling circus acts. @VendaidLtd want to applaud the continual great work of AVS & delivering national service on a local basis, here’s to the next 40 years. Hope the celebrations go well. Thanks to @AVSVendingGroupfor organising such a brilliant party last night! Had an awesome time! Great night had by all at @AVSVendingGroup40th Birthday! Great to see everyone and what fantastic entertainment!